Real Food Challenge at San Francisco State University. Courtesy of Real Food Challenge. Institutional food systems are typically a tough nut for food activists to crack, relying as they do on economies of scale and mass logistics. But the growing movement toward real, sustainable eating has a natural ally in hungry, well-informed college students – and ever since 2008, the Real Food Challenge organization has helped them speak with one voice for change. The challenge “leverages the power of youth and universities to create a healthy, fair and green food system,” according to the organization’s mission statement. To that end, the Real Food Generation organization – founded by Ghanian-born Harvard Kennedy School grad Anim Steel – provides coordination, support and tools to campus organizations that are working toward change. Their goal is to shift over $1 billion of university purchasing power across the nation in the direction of “real food”—defined as food that is “local/community-based, fair, ecologically sound and humane” in its sourcing – by 2020. So far, they’re active on over 180 campuses, with $60 million in purchasing pledges lined up, including major public universities in several states. To aid activist students in making their case to administrations, RFC provides the Real Food Calculator, a purchasing assessment tool that translates research into data that students can use to help make the case. When a campus signs up for the challenge, students approach food service professionals and form a food working group. That challenging part is just beginning. But the cause is a popular one, says Schwartz, and students often gain traction quickly. The folks at Real Food Challenge provides training, support and guidance to the students as they strive to impact the system. 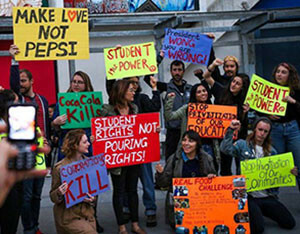 Their efforts are making news from California, where the entire state university system has signed on, to Maine, where activists succeeded in getting sustainable sourcing written into a food service request for proposals, clearing the way for the Maine Farm and Sea Cooperative to compete with food service giant Aramark.